Happy Little Bento: Creepy Egg Skull and Rolls plus EcoLunchbox GIVEAWAY! Creepy Egg Skull and Rolls plus EcoLunchbox GIVEAWAY! Creepy Egg Skull and Rolls Bento, a photo by sherimiya ♥ on Flickr. Let's keep going with the creepy skulls, shall we? This one is crafted from a hard-boiled quail egg, which is naturally skullish -- all you need to do is pinch the cheeks in a little and add some nori details. I made some turkey dog "sushi" rolls using black rice, and decorated the ends with freecut nori designs: bats and vampire faces. There are also some steamed broccoli and a little jack-o-pepper. I packed this bento for TinySprite in another stainless steel EcoLunchbox: this one is called the Solo Cube, and it's just the perfect size for my kindergartner. I packed this box along with the EcoDipper, containing some sliced peaches and berries. This size meal isn't too overwhelming for her, and she has no problem sliding off these lids. They stay on pretty well, but I secure both with elastic bands, just in case. I like the versatility that these two different shapes and sizes offer; you could fit a sandwich thin in the Cube, or some sausage skewers, some meatballs and pasta, or a chicken salad. The round Dipper is just right for a handful of nuts, trail mix, crackers, berries, or melon balls. I was so pleased with this duo that I mentioned it to the folks at EcoLunchboxes and they thought it would be a great idea to offer these two as a set to one of you, my bento-making readers! I know you'll love these as much as I do. They're well-made and look like they're built to stand up to years of daily use. If your child outgrows them, you can always use them for an afterschool or recess snack. My kids have been taking bento to school their whole lives and I was amused recently to find my daughter bringing home disposable items (from a field trip) because she's so used to re-using. If you're interested in trying out the EcoLunchbox Solo Cube and the EcoDipper, please leave me a comment below telling me whether you've made any efforts lately to be more "green", and include your email address so that I can contact you. I'll leave it open until midnight on Halloween night (October 31, 2012, Pacific time). U.S. only please. Thanks a lot for your interest! For more info, see EcoLunchboxes. Ecolunchbox provided the items I used to pack this bento today, but I received no other compensation, and the opinions I expressed are mine. WOW, your dog "sushi" looks so neat! and I love the egg skull, maybe I will make it for next week bento. BTW, I never know ecolunch have the solo cube, looks like it's perfect size, and I always love the separated lil container, it's great for either soup or fruit. As for my effort to be more green lately I reduced my shower time and never let the water running while I brush my teeth. I have made efforts to be more green. I now use reusable grocery bags, I try to buy all my eggs local and reuse all my egg containers (we go through 4 dozen a week! ), and buy as many fruits and veggies as I can from the farmers markets so that I can use my cloth bags there too. I recently got my SO to stop bringing microwave meals with him for lunch and now I pack a lunch for him everyday in a reusable container. I love it Sherri! The black rice is beautiful in color, well all the colors of these fresh foods delight! Less waste is another plus in the long list of why bento is the way to go for my kiddies and hubby's lunches! My hubby and I are also renovating our home which at one end is a huge headache, but on the other hand is an opportunity to lighten our carbon footprint. We've installed a geothermal system--also called a ground-source heat pump water heating system, which heats our home in the winter VERY IMPORTANT..I live in Finland folks!) It also cools in the summer time which is great too. All of our windows are double-glazed windows with a high-solar gain and low-E glass. The glass has argon/krypton gas inside them, which is perfect for my winter bound land because it allows sunlight in, but highly reduces heat loss. These are just some of the measures we've taken in our home make-over. All are highly energy efficient and means we can live comfortably without using or needing so much energy to operate. Your lunches always look so amazing. Love the new box! We've been trying to live green for years now and just decided to put solar panels on our roof. Very exciting. We've switched to cloth napkins and cloth rags for the kitchen but still reached for paper towels from time to time. With our recent renovation, I've moved the roll of paper towels under the sink, to be reserved to cat sick only. My family tries to be as green as we can. We most recently purchased a Kindle, to stop from buying books That usually only gets read once. I also grow plants in various different up-cycled food containers, so they don't have to go in the trash. I've been packing re-usable containers for Mimi's lunch instead of the awful plastic bags. Love your ideas for fun kid's lunches. Hi! I pack my lunch most days, I drive a hybrid, I'm planning my "green wedding" (with nothing disposable and everything bought at thrift stores ore rented, and I just signed up to get 25% of my electricity from green power sources. Our family is reducing waste by using bento boxes and snack boxes instead of sandwich baggies. We also recently signed up for our city's recycling program so I can have my recycleables picked up along with my trash. I don't have any EcoLunchboxes, but they're on my list of something I want to get, that's for sure! I pack my daughter's lunch every day, using containers rather than baggies & such. Also, I am in the process of eliminating a lot of the chemicals in our home. I quit buying fabric softener and switched to vinegar, lemon juice & baking soda instead of bleach. Hi Sheri! I looove your Halloween bento and I am inspired by your creativity!! I'm still new with all the designs and have a lot to learn from you! I love your healthy lunches!!! They are so inspiring every day! I am a mom of two as well and am working full time. I wake up around 6 AM to pack lunch for my school aged daughter, it is my favorite thing. Knowing that she is eating healthy and not wasting food. 1- We bike around town whenever possible (especially to the ice cream shop). My older one has a tagalong bike that she enjoys riding behind my husband's. We have a regular bike seat for my younger one behind mine. 2- We pay our bills online and receive electronic statements whenever possible - save on paper and no more filing!!! 3- When we do have to mail something, we reuse the envelopes that come with the junk mail. We use a white sticky label to cover the pre-printed address and write our own. 4- We stop as much junk mail as possible!! We hate to see junk mail coming into our house and having to throw them all into the recycle bin. They shouldn't have been printed, you know!! 5- My husband and I always save the one-sided printouts (when we can't print double sided) from work for my daughters to draw on. I live in Redmond, WA which recently stated a whole going-green campaign, so it's something that's been on my mind a lot lately. Forgot my email iaabami at gmail.com - for the comment with about 6 green things we do in our house. I am always trying to find ways to be more green. This year was the first year I had to pack a lunch for my kids so I invested in some reusable glass and stainless steel tupperware. I'm hoping to either make or purchase reusable sandwich bags soon. I'm also hoping to learn how to can soon so I'm not buying as many jars of tomato sauce and jam. I started packing my kids lunches this year and use reusable tupperware. I'm looking to either make or purchase reusable sandwich bags. Also hoping to learn how to can soon so I'm not buying as much tomato sauce, jam, etc. I love seeing all your creative lunches. I pack lunches with all reusable items. I have been learning to sew and have been sewing napkins and snack bags for them. Thanks for the great giveaway! These sound perfect for my 3 year old who starts preschool on Monday. We do several things to be green. Our most recent has been to buy milk and meat locally at a nearby farm. I'm now looking into cloth diapers to use for baby#2 we're expecting in January. I live in Bellingham and I can proudly say that since this summer Bellingham is a plastic free town! we have to use our reusable bags whenever we shop everywhere in Bellingham, or pay 5 cents for a paper bag. We also pay all bills online. I garden here and there and raise chickens so we enjoy our daily fresh eggs, and thinking to get a couple of sheep so we don't have to mowed the lawn all the time. I make my own laundry detergent, made my own apple juice and apple sauce from all the apples we got, then canned it. I love to cook so we almost never buy canned soup, I buy many things in bulk, and always packed my kids bento everyday since they started going to school. We'll continue our effort to be more green and so glad share and be inspired by all comments above. Keep it up! I've made up a bunch of "unpaper towels" for the kitchen and grab those to use on spills and to scrub the counter :) Thanks for the giveaway! i don't buy cleansers or detergents anymore. i make my own dishwasher and laundry soap, and use vinegar and castile soap to clean up with. it's better for us and for our four parrots, who are very sensitive to scents and chemicals in the air. We always use containers for lunches, wax paper bags or cloth bags for snacks. We've also always used cloth napkins instead of paper towels, or napkins, and whenever possible I use vinegar as a cleaning agent, and baking soda as well. Love your lunches! I try to be more eco friendly using more and more natural and non processed foods. I also always pack my son's lunch in reusable containers. 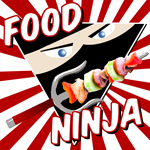 laura_rico@yahoo.com Thanks! 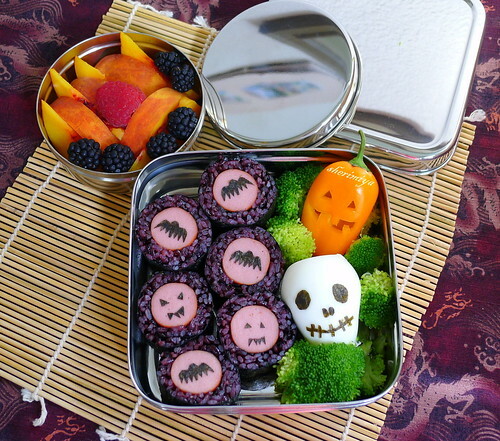 You Halloween bentos are always so creative and simple! The skull onigiri from the other day was a really cool idea! My husband and I have been riding our bikes to do errands, buying local produce from the farmers' market and buying our grains, beans and flour in bulk from the local co-op. We switched to a vegan diet, because it's more environmentally-friendly and... we pack lunches every day! I would love to have a nifty lunch container to pack those yummy lunches in! In our house our daughter got me into the bento lunches, what a fun a great way to use up leftovers creatively, although mine never are as cute as hers. I also try to use green bags for my shopping and I also use them to "wrap" many gifts when I give them. Cheaper and way more reusable than gift wrap. We have also replaced most of our lights with the flouresent bulbs. I love my recent purchase to use as Christmas gifts! Yes, we are trying to live more "green" these days. We reuse our bags, changed some light bulbs to more efficient ones, and recycle each week. My email is below. Yes, I pack my lunch daily and most definitely we turn off the lights when we leave a room. We try to recycle anything and everything we can and always bring our own reuseable shopping bags to the store. To be more green, I've been making a lot more bentos, carry my own non-disposable utensils, and a stainless steel water container. I try to incorporate more organic and local foods into my diet, and I am also a vegetarian. The personal care products I've been using are mainly food products (coconut oil, olive oil, lemon juice, etc.). I look for second hand first if there's an item I want/need. I also hand wash dishes, line-dry my clothes, use public transportation, carry my own bags when shopping, turn off water when lathering in shower/brushing teeth, and of course, reduce, reuse and recycle as much as I can. Plus, in an effort to make my school more sustainable, I've joined a club that is trying to implement a better recycling policy and working with facilities management to incorporate recycling as part of their trash collection. I love the idea of a stainless steel box, but I imagine it's sometimes tricky to pack since it can't be heated in the microwave. Oooh the black rice looks so nice! Can I ask what you used to make it that color? I actually have been (proudly) trying to be more eco-friendly. Along with packing my bentos, instead of running through multiple bottles of water, I've just done away with it and bough myself a nice reusable bottle (working on the thermos). It's not much, but I know it's helping. I LOVE this bento. Such a great color palette! I use Kleen Kanteen for water. Pay bills online. Bike or walk when possible for errands. DH takes his lunch to work. Use reusable grocery bags. Recycle paper, plastic, metal and glass locally. All lights are turned off unless in use. Shop at Farmer's market when possible. Condense trips by car. Using far less paper at work. Printing less! I have two sons on the autism spectrum and am trying to rid our lives of chemicals, GMO foods and other non-green and bad stuff. I am trying to find a good stainless lunch system and found this post while searching for reviews (hours upon hours). Thank you! We use cloth napkins and unpaper towels and also cloth diapers. We have also started shopping much more at the farmers market and buying local beef and pork. I am your newest fan! love your bento. I recently started making bentos for my Kindergartner. I am hooked. Love preparing his little meals, it's so comforting for both of us. He is so thankful for my efforts too! such a smart five year old! By not using ziploc bags and being careful of turning the faucet off while we brush our teeth are our first steps to being more green! To be more green, I have started using bento everyday for lunch. I also unplug things I'm not using- television, computer, etc. In the printmaking labs, there are always oily messes to clean up. Instead of using a roll of paper towels for each project (which gets kinda pricey) every time I wash my hands in the lab, I save the towel to clean up a mess I know will happen later on. It works really well in the printmaking lab, and the bonus is my hands don't look like I play in oil as much as they used to! Love ur bentos. Need to get my kids to eat healthier too. Bring dowm the spam consumption (in Hawaii)! I've been bringing my own bag to the grocery store. Even before it was ruled mandatory in SF!